ok. i am a list maker. no matter where i am, or what i'm doing, i've got many lists on my person. it's just me, it makes me feel focused. my favorite list at the moment is an idea i saw on a favorite blog here--a list of simple, attainable goals for the remainder of the year. 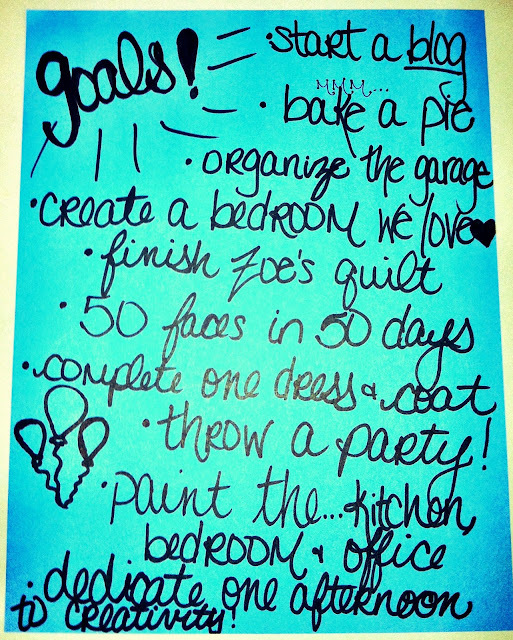 even just jotting my goals down on a slip of scrap paper at my desk rejuvenated my spirits and filled me with excitement! start a blog--one day in and i've already accomplished one! organize the garage--honestly, this is not going to be fun. at all. but i suppose life isn't always fun, eh? create a bedroom we LOVE--we've only been living in our home for a few months now, and though our room has everything it needs to function as a sleeping space, it's rather lacking in inspiration. time to change that. 50 faces in 50 days--i'm a mary kay consultant, and i've been challenged to facial 50 women in 50 days. i missed the deadline, but i'd like to do it on my time anyway. paint the kitchen, bedroom, and office--again, new to us house means new paint. it's just awful right now. dedicate one afternoon a week to creativity--i ran out of space on my paper, but that's what i meant. at least a chunk of 3 hours per week spent on pursuing something unique and new. anything that makes me think outside of the box. there you have it! my goals :) what are some things you can pursue that will keep the beauty in your life during the next few months?